Diets high in avocado oil are sometimes recommended for patients suffering from osteoarthritis of the knee. Like olive oil, avocado oil offers a variety of minerals and nutrients, and may provide health benefits when taken in dosages of 600 milligrams a day. Patients following an avocado oil diet are encouraged to maintain a steady intake of whole grains, leafy greens and lean proteins to maintain a steady supply of 2,000 calories per day. For best results, talk to your doctor about the best types and preparations of avocado oil for your condition. The avocado oil diet replaces traditional cooking oils such as olive, sesame, peanut, canola or vegetable oils with avocado oil. 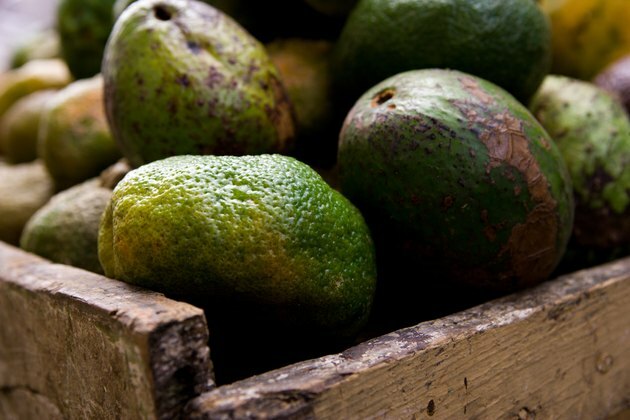 According to Drugs.com, avocado oil has been linked to reduced cholesterol and improved lipid profiles in some individuals, and may reduce the symptoms of osteoarthritis. Avocado oil is made from the pulp of the avocado fruit, which is composed up to 40 percent of fatty oils. One type of beneficial monounsaturated fatty acid, called oleic acid, is found in abundant supply in avocado oil. Depending on your doctor’s recommendation, you may need to take different dosages of avocado oil in either liquid or tablet form throughout the day. Diets rich in avocado oil were found to modify the fatty acid content of the cardiac and renal membranes, according to an animal study published in a 2005 issue of the “Journal of Ethnopharmacology.” In other words, the presence of avocado oil in the diet lead to an improved blood pressure response compared to the control group. In addition to its high concentration of monounsaturated fats, avocado oil contains quantities of carbohydrates and essential amino acids. A separate study published in a 2005 issue of “Journal of Nutrition” linked the dietary lipids found in the avocado fruit and oil with significantly enhanced carotenoid absorption, potentially improving the digestion of fats and other dietary compounds. Like all oils, avocado oil can create a laxative effect if taken in excess. Pills and supplements containing avocado oil are generally recommended in doses of 300 to 600 milligrams a day for osteoarthritis of the knee. Additionally, you may also drink a teaspoon of avocado once a day, or use it as a flavoring agent for salads, soups, rice dishes and other meals. Talk to your doctor about the ideal recommended dosage of avocado oil for your condition and try to gauge your intake to avoid taking it in excess. Avoid any detoxification diet that advises you to fast or to consume only avocado oil. In order to maintain an active metabolism, your body requires a regular intake of food. Fasting or drastically reducing your caloric intake below the recommended 2,000-calorie daily diet may have a negative effect on your basal metabolic rate, or the number of calories you automatically burn. While daily doses of avocado oil are generally considered safe, stricter versions of the diet should only be attempted under a doctor’s supervision.